The irreverent Wendy's Twitter account has never been scared to engage in playful ribbing, calling people out, or encouraging crazy people to go for 18 million retweets in exchange for a year's worth of chicken nuggets. However, it turns out they aren't scared of calling out the competition either. 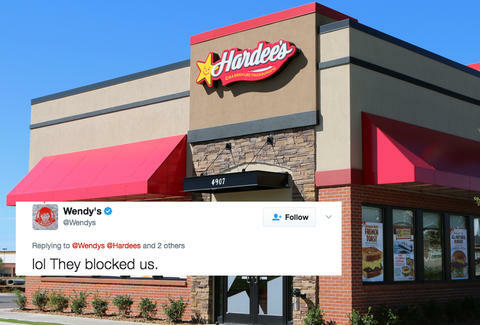 A hilarious Twitter exchange recently took place between Wendy's and fast-food foe Hardee's. The spat started when Hardee's jumped into a friendly disagreement between two tweeters. The tweeters were on opposite sides of the argument regarding which chain has the best "four-for-four" deal, in which you get four menu items for four dollars. It's a deal Wendy's has offered for a while and Hardee's recently started as well. Wendy's took note and called them out on it. Wendy's statement allegedly got it blocked by Hardee's for jumping in after Hardee's gave their "Amen." That beef got frosty fast. If Hardee's wants to ham it up in the Twitter snark club, dishing out cheesy burns, it has to be ready to get some mcribbing as well. Don't lettuce see you're a small fries that's chicken and unable to hash it with the biggies.